The highest amount of rainfall ever recorded in 24 hours is 182.5 centimeters (71.9 inches) in Foc-Foc, La Reunion. This occurred during tropical cyclone Denise on January 8, 1966. Rain allows us to create electricity through hydro-power. Forests that experience high levels of rainfall are called rain-forests. 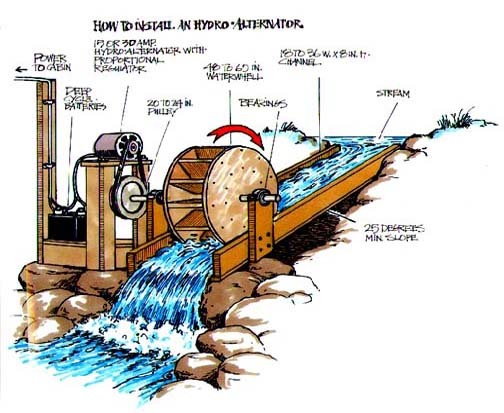 There are two primary methods for generating electricity from water. One method uses the energy potential of trapped water in dams in a more sophisticated version of the water wheel, and the other captures energy from ocean waves. Electricity generated from water is entirely renewable, since water is an abundant natural resource and no water is expended during the electricity generation process. For this reason, many nations rely heavily on hydroelectric power because they want to promote sustainable energy production. Interesting facts you didn't know about the Internet. Most famous social networking website Facebook founded by Mark Zuckerberg has more than 1,110 millions registered user as of March 31 2013. I hardly know anyone who does not have Facebook account. A news website contains as much information as a person of the 18th century could learn. According to the researcher Marting Gilbert from university of Southern California, 18th century person could master no more than 50 books in a lifetime. Whereas today, an average person is able to absorb the information stored in 600 000 books. Hong Kong is the world’s fastest internet place. It has blazing fast internet, an average peak speed of 54.1 megabits per seconds. At this speed you can download HD movie in about 4 minutes. Search engine giant Google can handle 35 billion queries in a month. Every 8th couple of today met online through internet. The first electronic smiley appeared in 1979 when Kevin McKenzie tried expressing his emotion by electronic means. The very first electronic look like -) then 3 years later Scott Fahlman added colon “:)-” and it looks we use to watch it now a days. Today 81% of emails are spam. For the year 2012, China accounted for 41% of the world’s attack traffic during the fourth quarter of 2012 making China top source of cyber assaults. United States is the largest country on Facebook, India standing 3rd. Croatia is the fastest growing Facebook country over past week. All Internet is 4 Exabyte’s of information. By the way, 1 Exabyte = 1000 petabytes; 1 petabyte = 1000 terabytes; 1 terabyte = 1000 gigabytes. Each year, this amount is doubled.